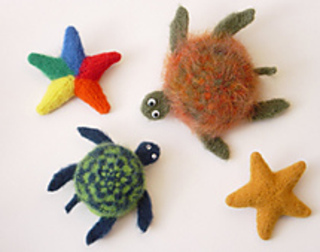 Felted fish need deep sea buddies like this felted Starfish and Sea Turtle. They work up quickly and make a great addition to felted fish mobiles. After felting the Starfish measures 6” (sport weight yarn) and 8” (worsted). 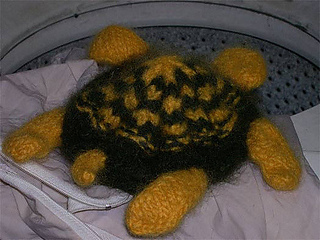 Sea Turtles are 8” (sport) and 10” (worsted). The Starfish can be made up in a single color or a 5-color rainbow. The Sea Turtle is at least 2 colors.